This is the first volume of a new series dedicated to the music of Charles Ives, performed by the Melbourne Symphony Orchestra and its principal conductor, Sir Andrew Davis. An amateur genius of avant-garde composing, who experimented with ground-breaking techniques years ahead of their time, the American composer started out with more conventional works � as shown by the two early symphonies recorded here. Part of the score of the First Symphony was submitted as Ives� graduation project at Yale University in 1898 but its unconventional structure did not match the taste of his professor, Horatio Parker. Looking back at it, Ives felt that Parker had coerced him into writing a pastiche-based work in order to help him achieve his degree. Although the most conservative of Ives� symphonies, it was first performed only in 1953, after the premiere of the Third, in 1946, and the Second, in 1951. The premiere of the Second Symphony was given by the New York Philharmonic under Leonard Bernstein on Washington�s birthday, and this momentous event in the overdue discovery of Ives� music matched the nationalistic nature of the piece itself, described by the New York Times at the time as �rudely, tenderly, fantastically and cantankerously Yankee�. 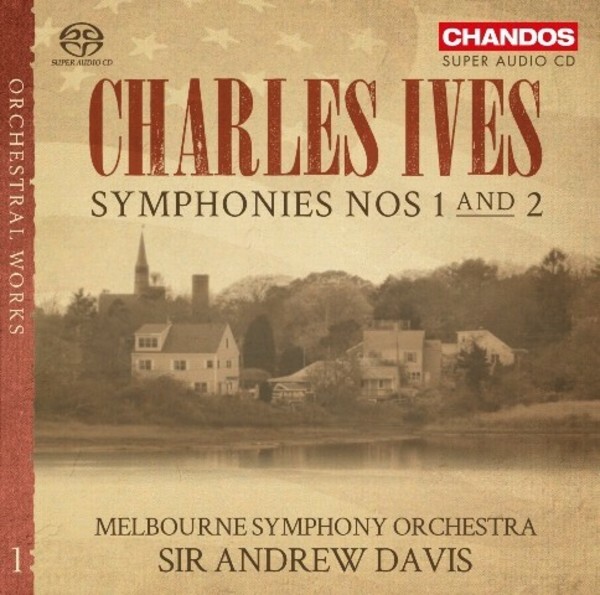 Exclusive to Chandos, Sir Andrew Davis is the conductor in many of our bestselling recordings and has already recorded two highly praised albums with the Melbourne Symphony Orchestra.